A true loss for the value investing community took place last week when legendary investor Walter Schloss passed away. Without greats like Walter Schloss, there would be no Gad Capital Management, Sham Gad Partners Funds, or anything else I have done related to investing. About four years ago I had the distinct pleasure of hearing Schloss speak in New York. 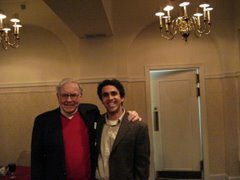 This was a gem of an experience - I think I was one of maybe 10 people getting to hear the living legend speak on value investing, Ben Graham, Warren Buffett, and many other great stories. My biggest takeaway: schloss's deep disregard for debt. He kept making the comment and I quote "I just don't like debt. There is too much trouble in having debt". Little did I know that Walter's cooments were a timeless lessons that would come to manifest themselves several months later. I count myself among the lucky few who were able to meet and speak with Mr. Schloss. From 1955 to 2002, by Schloss’s estimate, his investments returned 16 percent annually on average after fees, compared with 10 percent for the Standard & Poor’s 500 Index. (SPX) His firm, Walter J. Schloss Associates, became a partnership, Walter & Edwin Schloss Associates, when his son joined him in 1973. Schloss retired in 2002. Buffett, a Graham disciple whose stewardship of Berkshire Hathaway Inc. has made him one of the world’s richest men and most emulated investors, called Schloss a “superinvestor” in a 1984 speech at Columbia Business School. He again saluted Schloss as “one of the good guys of Wall Street” in his 2006 letter to Berkshire Hathaway shareholders. To Buffett, Schloss’s record disproved the theory of an efficient market -- one that, at any given moment, assigns a reasonably accurate price to a stock. If companies weren’t routinely overvalued and undervalued, Buffett reasoned, long- term results like Schloss’s couldn’t be achieved, except through inside information. Schloss, who never attended college, began working on Wall Street in 1935 as a securities-delivery “runner” at Carl M. Loeb & Co. The Schloss theory of investing, passed from father to son, involved minimal contact with analysts and company management and maximum scrutiny of financial statements, with particular attention to footnotes. An example was copper company Asarco Inc. The Schlosses bought shares in 1999 as the stock bottomed out around $13. In November of that year, Grupo Mexico SA (GMEXICOB) bought Asarco for $2.25 billion in cash and assumed debt, paying almost $30 a share. Schloss first met Buffett at an annual meeting of wholesaler Marshall Wells, which drew both investors because it was trading at a discount to net working capital, according to a 2008 article in Forbes magazine. When Buffett joined Graham- Newman, he and Schloss shared an office. While Buffett became a star inside the firm, Schloss was “pigeonholed as a journeyman employee who would never rise to partnership,” Schroeder, a Bloomberg News columnist, wrote in her book. How to Beat the Market? Avoid It. If I challenged you to take on Tiger Woods, how would you beat him? You may think I’m asking an idiotic question, but in actuality there is some great value to be learned here. The fact is Tiger is beatable and I know how to beat him: by not playing him in golf. As long as you take on the world’s best golfer in anything but golf, odds are you stand a good chance of winning. Think about this idea for a moment with respect to the stock market and investing. Your best chance of beating the market is by avoiding it. Let me explain. Today’s market environment is dominated by institutional money collectively managing trillions of dollars. These large funds demand equity research, analyst estimates, and other investment decision related needs. These services are gladly provided by the hundreds of equity research firms and investment banks who exist solely to cater to these needs. Because these investment funds are dealing with large pools of capital, they are looking for places to allocate tens of millions if not hundreds of millions of dollars in a relatively short amount of time. As a result, the vast majority of investment capital is playing in the same sandbox. And that sandbox is filled with larger cap companies that most are familiar with. There is nothing wrong with this approach; in fact by default it’s the only approach to follow if you are part of a large pool of investment capital. Luckily for the individual investor or smaller account (sub $200 - $300 million), you don’t have to play in this sandbox. In fact, in most cases you should try to avoid it because chances are that you will have no edge over the other players. In other words, there is a higher degree of efficiency when you have more participants. Of course when an opportunity like the financial crisis of 2008 leads to a market wide sell off and everything is on sale, that’s a different story. When you can buy a company like Apple for $90 in the midst of a market panic as you could have two years ago, you pull the trigger quickly. Or when Whole Foods (WFMI) was trading for under $10 a share in late 2008 after having earned $1.30 in 2007, you didn’t need to think hard about the value proposition. But those opportunities don’t come along so often. Today, financials offer the same home-run type opportunities but will likely take a little longer to play out. I would argue that Bank of America (BAC) for those investors with a 2-3 horizon will profit handsomely at today's current valuation. There is ample opportunity, however, where the big boys can't look. A $10 billion investmetn fund is not going to be spending a lot of time looking at companies with market caps below $500 million. And as a result, most analysts who service them aren't looking there either. Don’t make investing harder than it already is. Leave the big boys to fight over the big fish while you focus on the easy pickings of the smaller and potentially more lucrative opportunities. Happy hunting! Warren Buffett has spent the past 60 years amassing an untouchable investment record. His endurance through recessions, market bubbles, and financial panics is what truly sets him apart in the game. Buffett is indeed a value investor. When I apply the term value investor to Buffett, the definition I give is the response Buffett gives: what other type of investing is there if it isn't the act of seeking value? The concept of value investing as the only type of investing is a profound statement and one I hang my hat on here at Gad Capital Management. For the first 15 years or so in his life, Buffett made his money buying cheap, low quality cigar butts that pocketed him 20% - 30% gains in a relatively short period of time. That beginning gave Buffett his name. What made his career was a entirely different approach that he has honed in on for nearly 50 years: buying quality businesses at slightly undervalued or fairly valued prices. To most value investors, buying a fairly valued security seems contradictory to the value investing approach. On the contrary, I would opine that what gets many "value investors" in trouble is sticking to statistically cheap stocks and ignoring the value in quality stocks trading at reasonable valuations. The ultimate key to value is, of course, price. But if you buy a statistically cheap stock without any value creating catalyst, you many find yourself waiting a very long-time for that value to be unlocked. On the other hand if you are able to buy a quality issue at a reasonable price, you may come to find a lot of value creation over the years that such an investment is held. Indeed if you buy an excellent business trading at 90% of intrinsic value but that company can grow its future cash flows, then isn't intrinsic value going to increase over time, thus giving you a wider margin of safety? Isn't this the case with Apple (NASDAQ: AAPL), which out of great irony, has never traded at a nosebleed valuation over the past several years despite producing the type of growth rates that any tech company would dream for? In the company's most recent quarter, it generated $13 billion in net profit, almost the amount of income generated in all of fiscal 2010. Isn't a company with that growth potential and high quality trading at 20 times earnings a better value proposition than a single digit P/E, low book value stock that may suffer losses at the first sign of economic trouble? It is precisely this approach to investing that led Buffett to See's Candies, Coca-Cola, The Burlington Northern, and most recently, to committing $10 billion to IBM. When Buffett bought The Burlington Northern, esteemed value investors took him to task as paying too much for a capital intensive business. Now the consensus is that he bought the railroad for half of what it would sell for today. Making investments casts a wide net. Special situation opportunities like my recent discussion on Premier Exhibitions (PRXI) doesn't fit the mold of quality per se, but it does pass the test of probability. After all, investing is nothing more than a probabilistic exercise. What quality does is skew the probability of a favorable outcome squarely on the side of the value oriented investor.